Wish a special someone Merry Christmas with this beautiful bouquet of festive flowers. 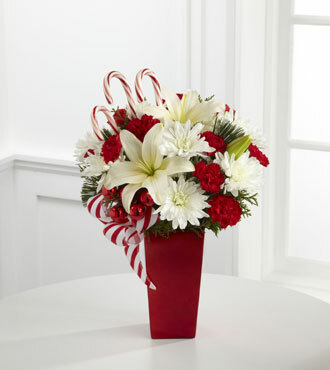 White Asiatic lilies, chrysanthemums, red mini carnations, and a variety of holiday greens make up this simple, but elegant, bouquet. The glass vase is decorated with red glass balls, candy canes, and candy cane ribbon to create a special look for the Christmas season.